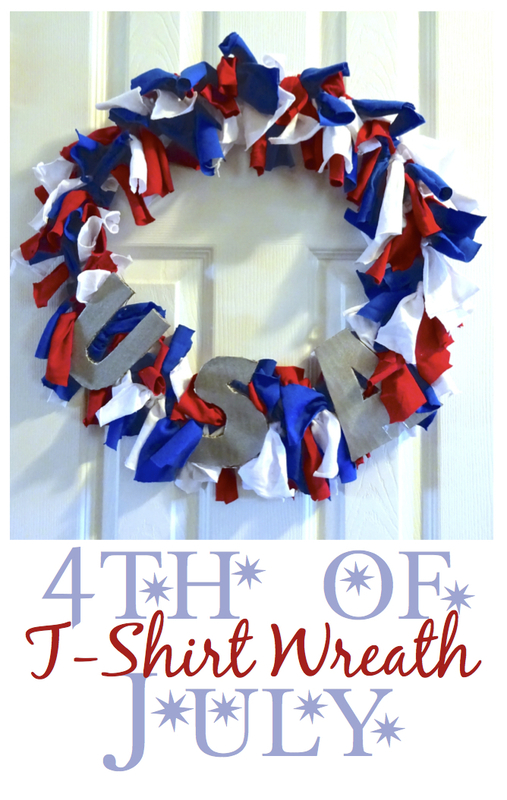 How to make an easy DIY Upcycled T-Shirt 4th of July Wreath in minutes! I was pleasantly surprised by how my first wreath attempt turned out (10 Minute Easter Egg Wreath) and I still had one extra wire frame in my closet, so I decided to try my hand at crafting a Fourth of July wreath. The Fourth of July is one of my favorite holidays–I love decorating and dressing up– and I’ve gotten an earlier start than usual this year! In fact, the girls already have their outfits picked out! Second, for this project I wanted to use only materials that I had laying around the house, so I could say that this wreath was actually free to make. 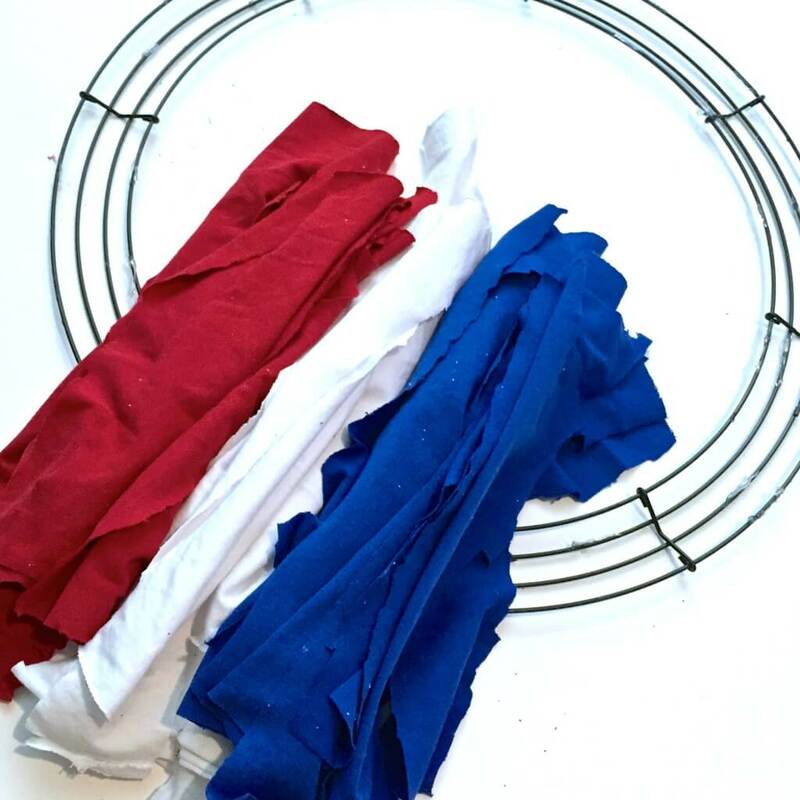 Fortunately for me, hubby just cleaned out his closet and had TONS of old T-shirts piled up to donate– including a red one, a white one, and a blue one — perfect! To start, I cut the shirts into strips approximately 8″ long and 2″ wide. The beauty of this is that your cutting doesn’t have to be precise, since the finished product will camouflage any crooked strips. This means you can zip through the cutting stage as fast as you want! Once I had a large pile of strips ready for each color, I began attaching them to the wreath. Again, this was super easy! I just tied each strip in a double knot around the frame and let the ends hang evenly on each side. 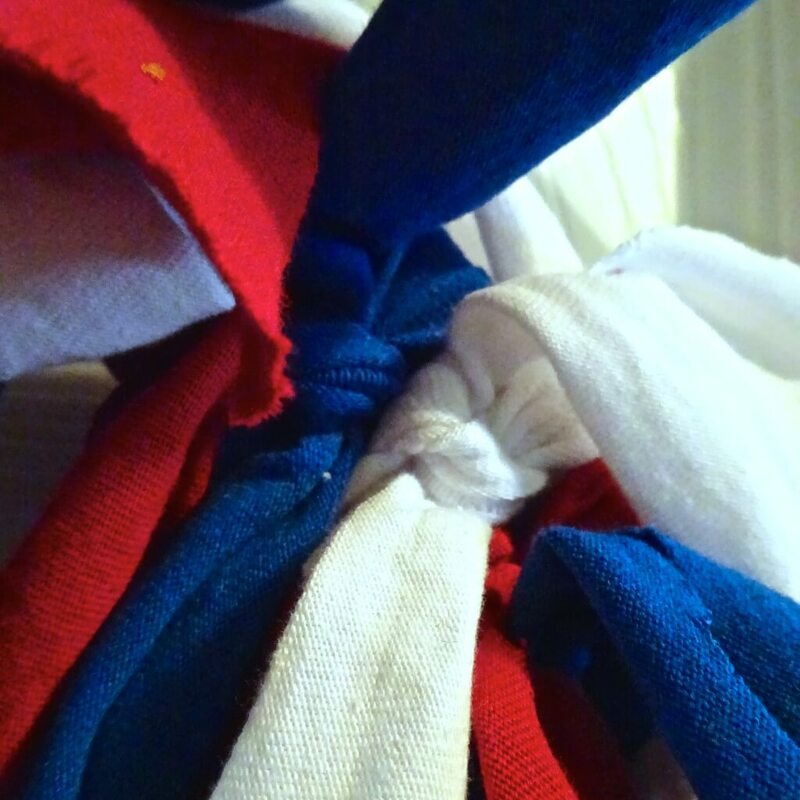 No fancy bows, no glue — just your basic knot. Continue knotting the cloth strips until you’ve completely covered the wreath frame, alternating colors as you go. The wreath is pretty enough at this point to hang, but I decided to look around for some accents — I thought silver would be a fun touch. So here you have it, the finished product — free and easy enough that your kids could make it! 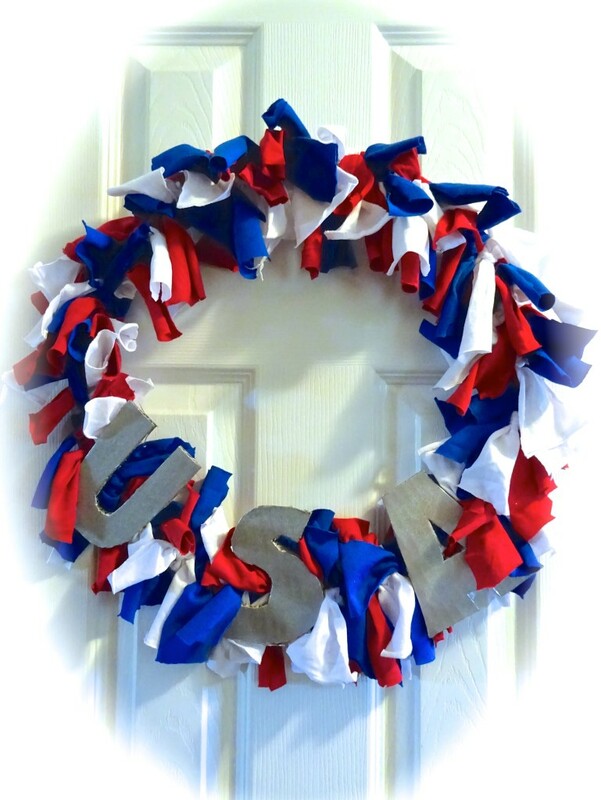 I love my new Fourth of July wreath and just looking at it puts me in a festive mood!